Theologians issued statements supporting Sister Margaret Farley. Last week an obscure 2006 book on sexual ethics by a nun, a retired Yale Divinity School theologian, rocketed to number 13 on Amazon’s bestseller list. Its dazzling success came courtesy of the Vatican, which sparked readers’ interest with its stern warning that Sister Margaret Farley’s “Just Love’’ contradicted Catholic teaching. Using justice as a framework for sexual ethics, Farley had written that masturbation, gay marriage, and divorce could be seen as morally acceptable. The church’s edict was the latest crackdown by the Vatican and US bishops on American nuns who as scholars, activists, and institutional leaders push the boundaries of Catholic doctrine. But, as leaders of a group of nuns arrive in Rome on Tuesday to meet with Vatican officials over recent sanctions, their supporters say the hierarchy’s actions have widened the chasm between the church’s male overseers and ordinary Catholics. Sisters have long been the face of the church to many of its people through their work in education, health care, and social justice. When the Vatican called US nuns “radical,” it ignored the rich history of women in the church. The church hierarchy says it is simply acting to preserve the purity of the church. Last year, US bishops condemned a book by Sister Elizabeth Johnson, a theologian at Fordham University, that the bishops found to contain numerous “misrepresentations, ambiguities, and errors’’ about church teaching. And in April, in its most significant move thus far, the Vatican issued a stern rebuke of the largest leadership organization of American nuns, the Leadership Conference of Women Religious, and assigned the bishop of Seattle to oversee its activities. The Vatican criticized the Leadership Conference for spending too little time promoting the church’s teachings against abortion and gay marriage, failing to correct unacceptable statements by speakers at its annual conventions, and opposing church teaching on the ordination of women. “The Vatican’s view is this: If we foster a purer, more orthodox church, it will be naturally more attractive to people, and one way to create a purer church is, in part, to enforce these doctrinal rules,’’ said the Rev. James Martin, a Jesuit priest and culture editor of America magazine. Representatives of the Leadership Conference, who called the Vatican’s criticism unsubstantiated and said it had “caused scandal and pain throughout the church community,’’ will meet Tuesday with Cardinal William Levada, the former bishop of San Francisco and the prefect for the Congregation for the Doctrine of the Faith. A Vatican spokesman said Monday that church officials hoped to achieve “a reciprocal understanding’’ of the Vatican’s actions. Historians say the root of the tensions dates to more than 60 years ago when, at the urging of Pope Pius XII, American sisters began seeking advanced degrees in order to serve the church more effectively. When the Second Vatican Council began reshaping the church for the modern era in the early 1960s, American sisters were highly prepared to respond, said Margaret Susan Thompson, a historian at Syracuse University. The council instructed religious orders to revive the spirit of their founders and apply that fervor to the problems of the modern world. 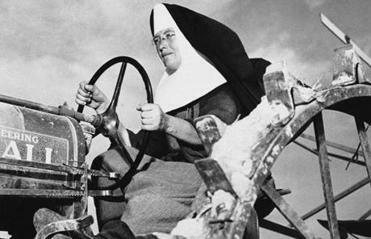 Nuns studied their histories and discovered bold, controversial women who were often critical of the status quo. “The irony is this whole process of renewal began in obedience to what they were told by Rome to do,’’ Thompson said. Over the next few decades, American sisters transformed their lives. Although some remained in more traditional settings, many nuns who lived a semicloistered existence behind convent walls emerged to work in the world, often trading religious dress for street clothes and living outside traditional communities. They became involved in the Civil Rights movement, the antiwar movement, and the feminist movement. “We were very much involved in the social upheaval of this country’’ and the church in the 1960s and early 1970s, said a sister and historian who asked not to be identified because of the sensitive nature of the situation. The Leadership Conference of Women Religious emerged in 1971 to help train sisters for leadership roles within their congregations. But some felt the Leadership Conference went too far, including a minority of American nuns, for whom the Vatican in 1992 created a separate leadership group. Tensions between the Vatican and the Leadership Conference have flared occasionally over the years, but things came to a head in 2009, around the same time some sisters lent crucial support to the Obama administration’s health care overhaul. The US bishops opposed the legislation because they believed it provided a backdoor subsidy for abortion. Some liberal Catholics see the Vatican’s actions against the nuns as a cynical attempt by the bishops to squelch healthy debate and distract from their own mistakes in the sexual abuse scandal. But church officials say the Congregation for the Doctrine of the Faith is simply doing its job by mediating doctrinal disputes and affirming the central teachings of the church. “The concern, particularly at the top of the church, is that the Catholic Church become too secularized, too intimidated by its cultural despisers, and it’s time to reassert the core principles of Catholic identity,’’ said John Allen, Vatican correspondent for the National Catholic Reporter. And, as the hierarchy sees it, nuns have a special responsibility to strictly adhere to church doctrine. Donna Bethell, chairwoman of the board of Christendom College in Virginia, said the Vatican did not even punish Farley; it merely barred her book from being presented as Catholic teaching. “It doesn’t send her to the guillotine; they haven’t threatened to imprison her in a dungeon,’’ she said. And a coalition of left-leaning Catholic groups calling itself Nun Justice Project has held more than 50 vigils to support the Leadership Conference around the country.